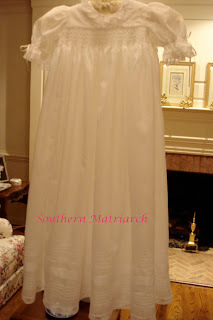 Remember when I posted about the reader who contacted me because she wanted help making a christening gown for her granddaughter? Well a few hours on the telephone, a dozen camera charges and a couple of hundred emails later and here are the results. She has done a gorgeous job. I knew all along she could do it. She hadn't smocked since this baby's mother was a child. Just like riding a bicycle, she is back at it with great results! She used Eternal Love from AS&E Issue 42. She purchased her supplies from Bessie Mary. Thanks Jan! It was delightful fun helping someone rediscover a forgotten passion. I just know that her granddaughter will benefit from this refound love of smocking and heirloom sewing. The christening is this Sunday, and I know it will be a day for all of them to cherish. I am glad to have been a part of it. The pictures may have my stamp on them, but the stitching was all hers. Great job Mary! what talented people you both are! And good on you for your generous nature. Thanks for visiting my blog and leaving a comment on the needlework my great aunt did. You have a lovely blog, and I enjoy seeing the handwork you've done. How wonderful that you've helped another rekindle an art. I'll be back to visit. Wow you really are a great teacher to be able to teach her how to sew this beautiful gown via telephone, etc..... Gorgeous!! What a way to restart your smocking engine. Just look at what your mentoring has accomplished! You should be very proud. What a lovely gown and how kind of you to help make this happen. 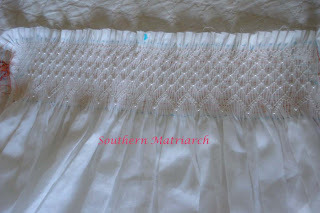 You have given an extraordinary gift of your time and talent and reignited a love of smocking. Blessings to you, the grandmother, and the sweet baby to wear the gown. This is so beautiful! What a talent to be able to teach over the phone! Hello, everyone! I'm the grandmother! I'm so amazed to have finished this beautiful gown and am so proud (humbly proud) of it. 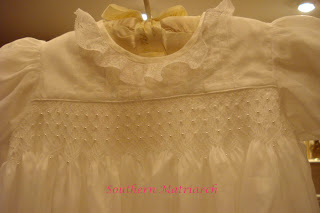 What a great delight in my heart to see it being worn by my first little granddaughter at her baptism yesterday. But . . . the primary reason I want to identify myself is so I might express my heartfelt gratitude to Martha. This could not have been done without her. Truly this is so! She kindly guided me through every single step (and sometimes twice through a step!) every single day, even as she was traveling. She encouraged me when I wasn't very sure of myself. Her step by step directions via email still amaze me. What a talented, kind, generous teacher she is! Thank you, Martha. You are an angel to me and, though I've never met you face to face, I am blessed to know you. You gave me the gift of time and talent so unselfishly and without fail. Know your "present" was acknowledged yesterday. Everyone heard all about you and the fun I had with you. A heartfelt prayer of thanksgiving for you was whispered as I watched the ceremony unfold. 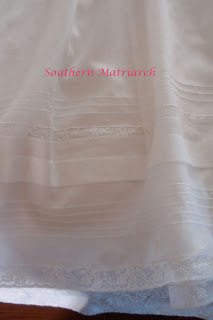 And, Martha, you taught me more than just sewing and smocking. You taught me love, joy, patience, kindness, goodness and faithfulness. May God bless you always! to me. Quicker than a blink of the eye. I didn't have time to pause and Jan made sure I didn't have to. She and Martha have it together, I tell ya! And Sarah knows how much I appreciate her for suggesting I go to Martha in the first place. She loves you, Martha, and I see why! These three women are just simply special! How nice of you to help make a dream come true! The dress is gorgeous! I love your blog! I am a follower to enjoy all the beautiful things you create. I don't know how to smock, I do know how to sew. I live in the northeast and I can't find anybody to teach smocking here, do you have any recommendations for a beginner. I would love to create these sorts of things for my 4 yr old daughter. Thanks so much!